On a dark, wet, cold Winters Day what better than a bright, colourful sunshine bright bear like Sammy to cheer you up! Isn't he gorgeous? He is 10" tall and is made of vibrant tangerine backed orange tipped German alpaca, soft, dense and totally gorgeous. His body is made of deep dark brown Schulte mohair, silky soft and very thick. His pads and paws are soft gold cashmere, he has a black stitched nose and shiny black German glass eyes. Sammy is loosely jointed with a wobble head joint which gives him added character, his arms and legs are filled with polyester and plastic and he has glass beads and plastic pellets in his tummy. Sammy is not as heavy as some of our bears, but that is deliberate. He has long curved arms and quite short legs with shaped footpads. He also has a really pretty wooden heart shaped belly button painted with flowers. 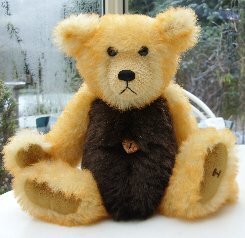 I hope you like him, he is a lovely cuddly bear in fantastic colours, Sammy costs £77.50 plus postage. Please note that as with all our bears, Sammy is not a toy and is not suitable for children. Sorry - Sammy has been adopted.